Three things immediately stand out when looking at the Industrial Air Contractor CTA5090412 compressor: the bright orange color, the funky pontoon design, and the Honda gas engine. 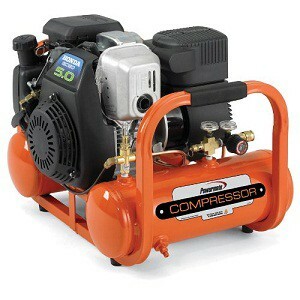 It is a well designed unit and one of the few gas powered compressors that are this compact in size. The fact is that not everybody works in areas with easy access to electricity. Let’s see how this air compressor manufactured by MAT Industries stacks up. The Industrial Air (or Powermate) CTA5090412 is a pontoon-style air compressor with a couple of 2-gallon tanks. The design allows for better balance and portability over the typical single tank design. Since this unit is gas powered, its weight (74 pounds) is bit heavier than the average electric compressor with a similar air tank capacity. That said, the CTA5090412 feels lighter and more portable than you’d think it would be. The entire layout is very well thought out and the compact size makes it easy to store, transport, and use on a job site. A quick look will make you think that this compressor is built to last; which it most definitely is. An easy to access drain valve, regulator, and gauges shows the product engineers put some time into it. A quick connect hose fitting and cushioned handle are also featured. 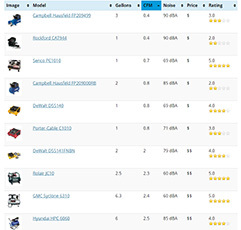 While an air hose or accessories are not included, most professionals agree it’s better to choose your own instead of the lower grade add-ons most manufacturers include. Take a look at our recommended air hoses. 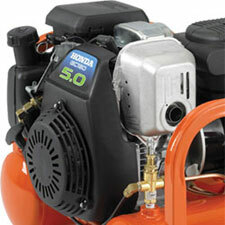 At the heart of this contractor-rated air compressor is 5 horsepower Honda GC 190 (OHC/OHV) engine. Even if you know nothing about compressors, you’ll likely agree that the Honda name is synonymous with quality and performance. It allows for easy starting (generally in one pull), smooth running, and low emissions and fuel consumption. A 2-piece cooling system does a great job of keeping operating temperatures low thus providing better pump efficiency and ultimately extending the life of the pump. You will be hard pressed to find other oil-less models lasting longer. 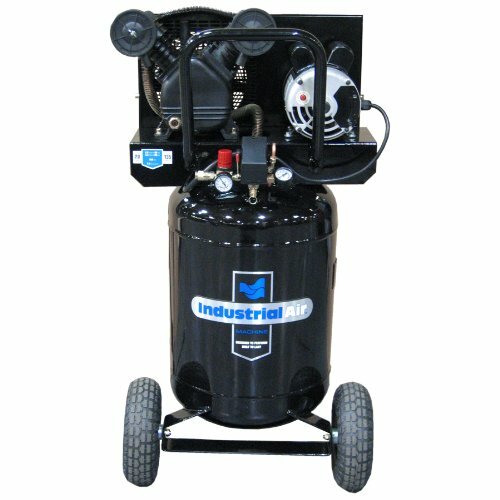 Putting out 5.0 CFM at 90 PSI makes the Industrial Air compressor a powerful small compressor. With a max pressure of 155 PSI, the unit may actually provide more airflow on a charge than some bulkier 6-gallon models. With an air hose splitter, you can easily run multiple nail guns at the same time. As of this review, we have not been able to locate a decibel rating for this compressor. We are awaiting a response from the manufacturer. Owners of the CTA5090412 who have had previous air compressors seem to agree that this unit is average to slightly louder than average in regards to operating noise. This is probably due to the fact that the compressor is gas powered and runs at fairly high RPMs. Because this unit is meant for outdoor use and a lot of times in remote locations, noise is not much of an issue. The Industrial Air Contractor CTA5090412 compressor is most recommended for those who require the use of air tools in areas where electricity is not an option or simply inconvenient. Those who have a lot of land on their property, are in remote areas, or don’t want to deal with the hassle of chaining together multiple extension cords should put this strong unit at the top of their wanted list. Some examples of great candidates for this compressor would be the homeowner building a fence around their 3-acre rural property, the farmer filling up the tires on his agricultural equipment, or the weekend racer in need of an impact wrench to quickly change tires and work on their car. This is really a great little gas powered air compressor. While the price is high, and frankly the only thing that doesn’t make this a 5-star compressor, the convenience you get by being able to take this unit where others can’t go is worth it to many. The Honda powered engine let’s you know you are getting something that will last you many years. With a 2-year warranty, you know the manufacturer is confident in the quality of its product. 5 HP, 5 CFM, and 155 max PSI are great numbers for a small portable compressor. While the pontoon design is different, it has many benefits. No real accessories are included but that just allows you to purchase exactly what YOU want. The Industrial Air CTA5090412 should definitely be considered for title of best portable gas air compressor.